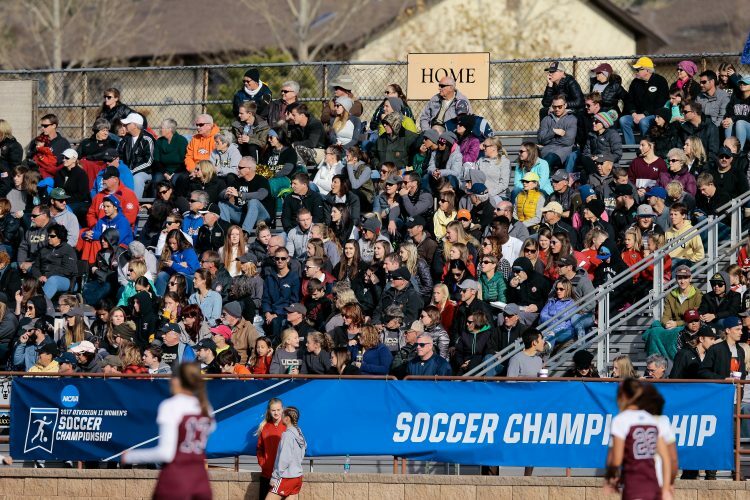 UCCS hosted the West Texas A&M Lady Buffs in the second round of the 2017 NCAA Division II Women’s Soccer Championship at Mountain Lion Stadium. The UCCS Athletic Department placed third among 15 schools and recorded its highest finish in the 2017-18 Rocky Mountain Athletic Conference All-Sports Competition Cup. UCCS earned a department record 797.5 points. The RMAC All-Sports Competition Cup is awarded to the institution that accumulates the most points over the year based on its teams’ outcome in the RMAC’s four core sports, along with six wild card sports. The four core sports are football or men’s soccer, men’s basketball, women’s basketball and volleyball, while the six wild card sports consist of three men’s sports and three women’s sports, which are designated by that institution’s best finish in those 19 non-core sports (23 total RMAC sports). Total RMAC All-Sports Competition Cup points are calculated based on how the teams finish in the RMAC regular season standings. In the scenario where teams do not have regular season standings, conference championship results are used. If there is a tie, points are combined and divided by the number of teams involved in the tie. Point fractions were rounded up if above .5. The Mountain Lions earned 293 points out of a possible 300 points in the women’s wildcard sports. UCCS won the 2018 RMAC women’s indoor track & field championship and the 2018 RMAC women’s golf tournament championship, marking the first conference championships in both sports. UCCS also placed second overall in the 2018 RMAC outdoor track & field championship for 93 points. In the men’s wildcard sports, both indoor and outdoor track & field programs placed second at the conference championships to earn 92 points each. A third place finish in the regular season standings for the baseball program garnered another 78 points, bringing the men’s wildcard point total to 262. UCCS tallied 242.5 points in the core sports of men’s and women’s basketball, men’s soccer and volleyball. The volleyball program led UCCS’ core sports with 74 points after a fifth place finish in the regular season standings. Men’s soccer tied for fourth place and notched 68.5 points. UCCS’ men’s basketball team added 58 points and the women’s basketball team added 42 points to close out the core sports. Individually, 10 Mountain Lions earned RMAC Player of the Year honors in 2017-18: Jonathan Cowles (Baseball Freshman Pitcher of the Year), Colin Prater (Men’s Golfer of the Year), Julia Baroth (Women’s Golf Freshman of the Year), Skylyn Webb (Indoor and Outdoor Track Athlete of the Year), Kaija Crowe (Indoor Track & Field Freshman of the Year), Natalie Church (Lacrosse Freshman of the Year), David Meyer (Men’s Soccer Goalkeeper of the Year), Taylor Proctor (Women’s Soccer Goalkeeper of the Year), and Tarah Patterson (Women’s Soccer Freshman of the Year). Additionally, three coaches were voted the RMAC Coach of the Year: Sadie Farnsworth (women’s golf), and Ross Fellows and Brandon Masters (women’s indoor track & field). Of the 16 NCAA sports UCCS sponsors, 14 competed in the RMAC post-season, and nine programs qualified for the NCAA post-season. This year’s 797.5 points bested last year’s fourth place finish by 27 points.